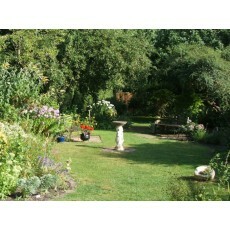 The garden which has a Grade 2 listed boundary wall is opening as part of the Blandford Hidden Gardens. Ancient fruit trees and mixed borders are being replanted with finds from HPS meetings and visits to open gardens and nurseries across the country. Enthusiastic propagation by seed and division etc. Some uneven and grass paths but wheelchair accessible. Blandford town centre, access via door adjacent to The Sapling Gift Shop and opposite Sweeney Todds barbers. Town centre pay and display car parks or short term free street parking.